So far for my summer reading list I haven't gotten to far. Mostly because mid-way through I decided to revisit some old favorites and now will have a while (its a twelve book series) before I get back to my list. So far I have finished Unspoken, by Dee Henderson. Again she never lets down. 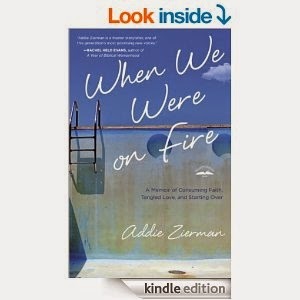 The second book I finished was by Addie Zierman's "When We Were on Fire", as I said before I had the pleasure meeting her when she spoke at our church with a friend of mine on writing. In real life she is authentic with a great sense of humor and her book did not disappoint. Addie's book talked about her being the Evangelical poster child. Addie Zierman wore three bracelets asking what Jesus would do. She also led two Bible studies and listened exclusively to Christian music. Addie and I had similar upbringing in being brought up with the "church people" but where she became the poster child, I lived the double life of church girl and secular world princess. Though our lives took different turns in those high school days, I could relate so much to her story. Trying to live up to standard, that you've self-imposed on your self and never feeling like you can make it. Addie's book was heart-wrenching as you watch her struggle through it. And so brutally honest about life that you have no choice as a read but to dig deep in your self too. To wonder if you're done dealing with the aftermath of falling short of the line. The last line of the amazon description sums it up nicely. "It’s a story for doubters, cynics, and anyone who has felt alone in church." Being all three I have to say this book hit the mark. It also awaken me to memoir writing a genre that I haven't really read before. I look forward to her next book she is currently working on.